The time has come. For the closing of one door, and the opening of another. I started this blog in 2009, and, as the name suggests, it came out of the place of boredom. I was feeling unsatisfied with my career, and wanted a place to be creative that was just mine, but that was also a way to communicate with people who were interested in the things I was interested in – books, movies, TV, other stuff. And hence, Boredom Abounds By Julia was born. Since starting the blog in 2009, I’ve gotten married, and last year we had our first child. It’s been the most amazing journey of my life, full of ups and downs (but mostly ups! ), but unfortunately my blog has suffered. I love blogging. I love writing, I love finding the humour in things, I love being honest with my opinions, and I love hearing what you (yes, you!) think about what I write, good or bad. I have tried hard not to constantly sit in front of a screen while my husband and child potter around in the background. I want to be a present wife and mother, and combining that with returning to work part-time, and juggling motherhood and marriage meant that my blog has been neglected quite a bit. But as I find my feet and settle into my new routine as a working mother, I’m trying to find some time to myself again, that time that I would use to write my blog. However, I’m no longer bored. Far from it! Working and having an eighteen month old toddler means I rarely have down time. Not because I’m constantly full to the brim of motherhood duties. More because I have a lot I want to achieve and I have a lot of hobbies, on top of raising a child and being a wife. So I have a to-do list as long as my arm, full of those household jobs that are always there, but also full of things I want to learn and experiment with and achieve for myself. And so boredom no longer abounds. I have decided to bring Boredom Abounds By Julia to a close, and I want to thank my readers for their support and for coming here and reading the things I had to say for the past three and a half years. It has been greatly appreciated! However, as I said, I do still love to write, and I do love the blogging medium. I have always hoped to turn my writing into something bigger than just a personal blog – what that is I’m not sure of yet. But I do know that I needed to stop and change direction. And so I’m launching a new website – still a blog, but with a fresh look, and a new location. Some things will be the same, some things will be new. There will be some of the same sort of posts, as well as shorter ones, more suited to publishing on a more frequent schedule (when my schedule allows for it), but the most important thing is that it will remain my voice. Although I am a mother, I am not a ‘mommyblogger.’ My husband and child are part of my private life and I won’t be writing specifically about them or posting photos of them over at my new website. Not that there’s anything wrong with that, it’s just not my kind of thing. My new blog will remain an entertainment and lifestyle blog over and above anything else, and I really hope you’ll come over and have a look around. So thank you for reading, today and all the days you came by to relieve the boredom! And now I’d love for you to come and say hello at Chic To Do - a blog about getting stuff done with style. Wow, it's definitely Winter in Melbourne. Rain, cold, grey skies, and a baby with a horrible cough. Hooray! Hopefully you can warm yourself up with these great links though! - Watch this massive crowd waiting to watch Green Day spontaneously sing Queen's Bohemian Rhapsody. Will singing flash mobs be the new dance flash mobs? - The Kitchen Coquette lists their best dessert recipes. Soft centred chocolate tortini with Ferrero Roche crumble, anyone? YES PLEASE. - Do you have Bitchy Resting Face? You're not alone. - A bride requested that her guests undertook a 21 day vegan cleanse so they would look good on her day. I'll just let you absorb that for a minute. I know, right?? If I knew that bride I would decline the invitation to her wedding with a note and a photograph of myself stuffing a hamburger, a chocolate shake, and some greasy shoestring fries down my throat. We had a big family party over the weekend, a very important birthday for a very important person, and I was able to contribute a few things to the big event: a cake and some flowers. The flowers were held in a bunch of different sized jars I've been collecting for the last year or so, and I used a pad of scrapbook paper from Spotlight and some scissors that cut in squiggly lines to cover the jars in different patterns. 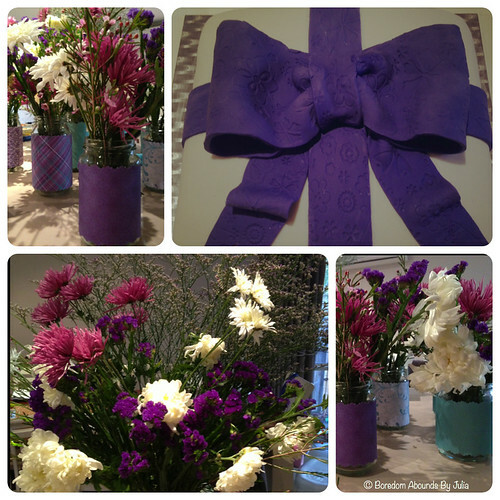 I wanted to also tie some brown twine around the neck of the jars, but ran out of time. The cake was a chocolate mud cake and the colours for the party were purple and turquoise, but i couldn't find ready made turquoise fondant, so I thought purple would be nice. 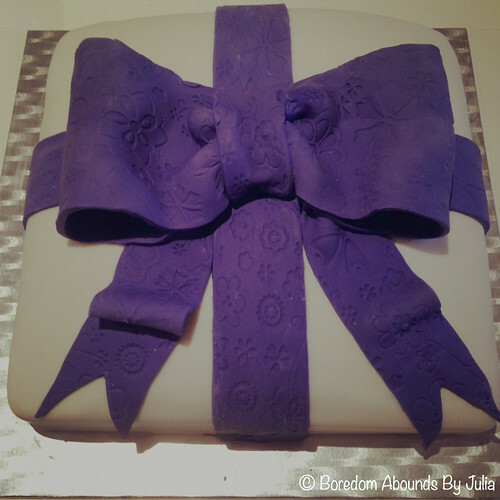 I have been wanting to try a large fondant bow for a while now. I am very pleased with the result. The fondant got a bit dry once it was on the cake, but luckily no cracks appeared. I realised it was probably because I used too much cornflour to knead it, so I won't make that mistake again. Lorde is a 17 year old girl from New Zealand. I first heard this about a month or so ago on the radio, and I love it. Her voice reminds me a bit of Natasha Bedingfield, and this song is ridiculously good. People, it is nearly JUNE. That means WINTER IS COMING. That is crazy. To distract ourselves from the impending misery of a Melbourne Winter, let's look at some links! - You need to watch this man's conversations with his 2 year old daughter, as acted out between him and another adult. Hilarious. - 15 reasons why Dylan McKay is the perfect high school boyfriend. - The Buffy finale is TEN YEARS OLD. Take a look at 27 moments you'll never forget from the final episode. - A teenage girl has invented a way to block spoilers on Twitter. She wrote the code by herself in ten hours, and it's just 150 lines of code. Well done, I say! - Please enjoy this list of all of Kramer's jobs. - Then take this Seinfeld quiz matching now-famous actors to their guest parts on the show. I got 100%. YES. It's 1950 and Flavia de Luce is an eleven year old girl living in at Buckshaw, a formerly grand mansion in the small English village of Bishop's Lacey. An apsiring chemist, Flavia spends most of her time locked away in her fully functioning laboratory performing chemical experiments with frighteningly accurate results. The rest of the time she is being tormented by her older sisters, Daphne and Ophelia (aka The Devil's Hairball), or roaming the countryside and bellowing at the top of her lungs on Gladys, her trusty bicycle. The three girls live with their widowed father, Colonel de Luce, their irritating housekeeper Mrs. Mullet, and Dogger, a former prisoner of war and general caretaker. Life at Buckshaw gets interesting when Mrs. Mullet finds a dead bird on the doorstep with it's beak piercing a postage stamp known as the Penny Black. A few hours later, Flavia finds a man in the cucumber patch and witnesses his last words and dying breath. Overcome with curiosity and delight at the forensic investigation that takes place at Buckshaw, Flavia begins to examine life at Buckshaw, and her father, in greater detail. When Colonel de Luce is arrested for the murder, he opens up about life at boarding school, the theft of a priceless item, and the apparent suicide of one of his teachers. Convinced that her father is innocent, Flavia's investigation of the murder intensifies, much to the annoyance of Inspector Hewitt at the police department, and she manages to solve the crime, though not without getting herself into a bit of hot water along the way. I've had this book on my 'to read' list for quite a while, and when I finally got around to reading it, I was completely delighted. Flavia de Luce is an hilarious protaganist - intelligent, glib, and cheekily arrogant, she is the perfect mix of Agatha Christie and Nancy Drew. Bradley's cast of quirky characters that reside in Bishop's Lacey add an additional layer of charm to the story, particularly during Flavia's interactions with them. Her superior, couldn't care less attitude towards Bishop Lacey's who only hinder her attempts at clearing her father's name is quite amusing coming from an eleven year old girl. As she gets closer to solving the crime, Flavia's patience with the adults in the village wears thin, and her boldness and cunning tactics increase with equal parts hilarity and intensity. 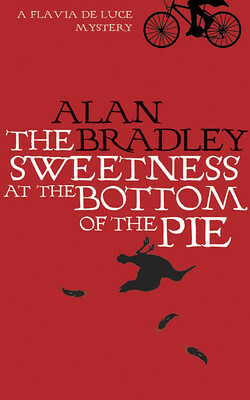 The Sweetness at the Bottom of the Pie is a clever romp through the young adult murder mystery genre. Flavia de Luce embarks on her investigation with youthful arrogance, and quickly proves herself as a fearless super sleuth. Bradley's sharply written story is full of witty barbs and condesending observations about life in Bishop's Lacey seen through Flavia's eyes, and it's clearl she thinks she knows better than everyone else. It's a delight from start to finish, with a good dose of suspense dolloped throughout. Two weeks ago I featured another song with Pharrell Williams, and I can't resist featuring this one as well.